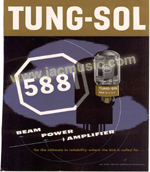 These TUNG SOL branded tubes are new production by the REFLECTOR company in the UKRAINE. So these are either new designed tubes such as KT120, a nice replicas of the 6550, or a KT66 which is a genuine replica of the british MO Valve Company, or just products as their ECC803S, which I have found to be a normal 12AX7. So not really having the tighter ECC803S specs. 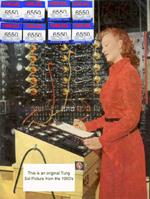 As you may know, some of the replica tubes made for New Sensor, only carry the name of their legendary examples, but are nothing but a normally known tube, in a new jacket, and poorly specified. Not so for the Tung-Sol 6550. This is a really nice replica of the original Tung-Sol, as is was made by Tung-Sol long ago. 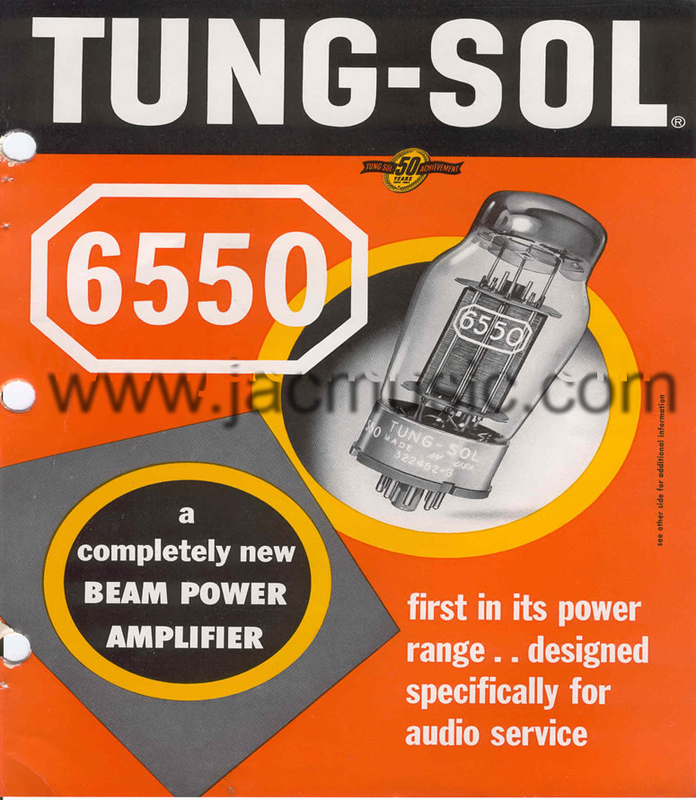 The glass shape, and also the plate shape and internal construction with the three holes, the white socket print, this is an true copy of the historical Tung-Sol 6550. 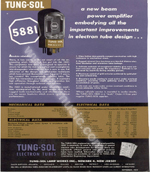 The 5881 carries ratings similar to the 6L6 except that the allowable screen dissipation is 3.0 watts instead of 2,5 watts while the maximum plate dissipation is 23 watts instead of 19 watts for the 6L6. Glass shape and socket color, is vintage. So yes, all in all this is a very well done, and beautiful looking replica. 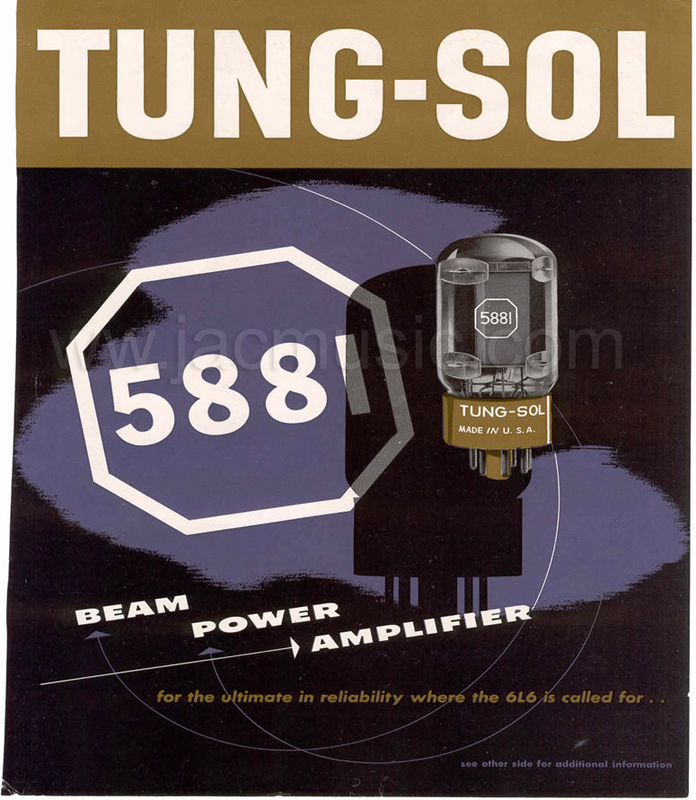 Much recommended as an upgrade for your 6L6 or KT66 amplifiers. . There never was a KT120m, and it seems we have a very nice tube here. 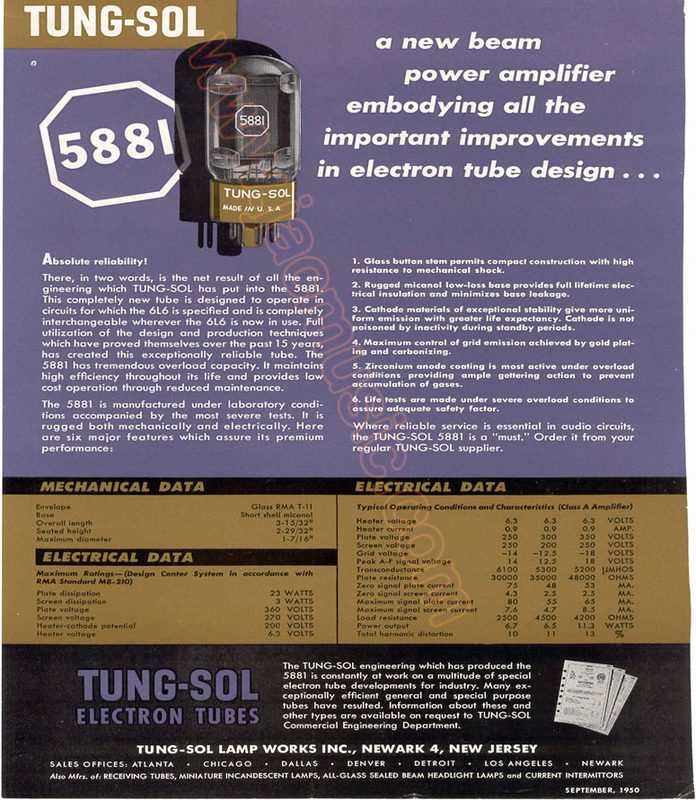 New Sensor now announces the Tung-Sol KT120, which has a plate dissipation of 60 watts, making it the most powerful tube in the 6550/KT88/KT90 family. 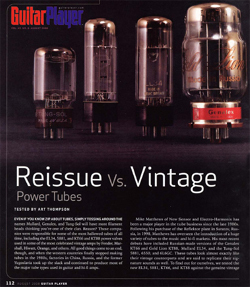 A pair of these tubes in push-pull configuration can deliver power levels of 150 or more watts. 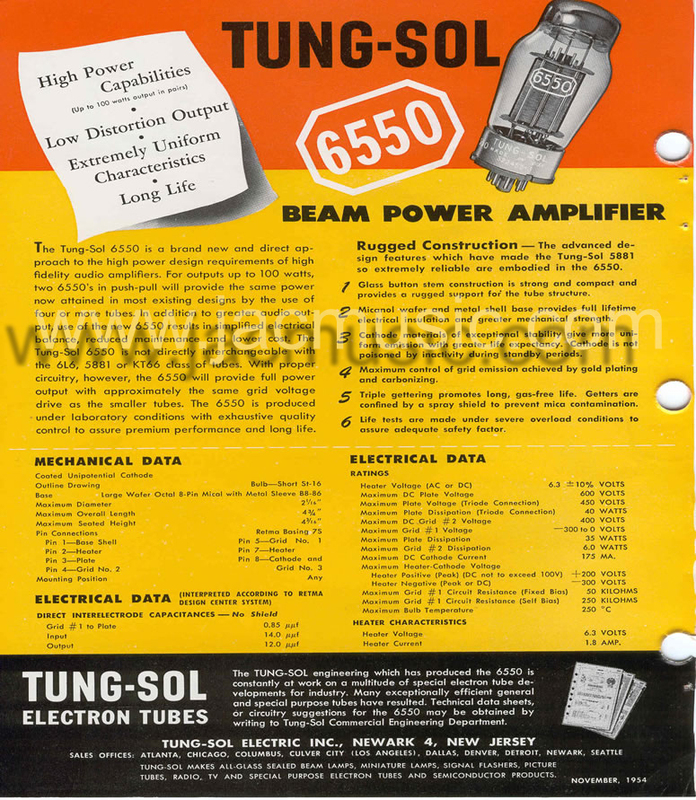 When used at the parameters found in existing 6550/KT88/KT90 circuits, the Tung-Sol KT120 is impervious to overload, delivering peak power with extreme reliability and long tube life. 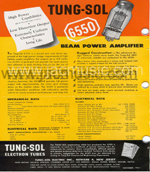 However, taking advantage of the higher current handling capacity of these tubes, a very unique and super powerful and stable amp can be designed using the Tung-Sol KT-120. It can even do 20 Watt Single ended at low distortion, provided you use it in the Ultra Linear mode. 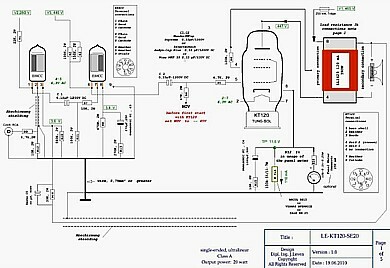 Here is a nice and tested circuit diagram, by an experienced German engineer. Extremely well tested, with distortion charts, etc. We offer this tube here, because it is a good selling product. However I do not accept this as a real ECC803S. There are several specific differences between ECC83 and ECC803S, and with all due respect, I don't see any the ECC803S specialties here. Still of course this very nice ECC83, with EC803S stamped on the glass.